The CoffeeShop Blog: CoffeeShop Fall Mini-Session 2 Photographer Template! CoffeeShop Fall Mini-Session 2 Photographer Template! 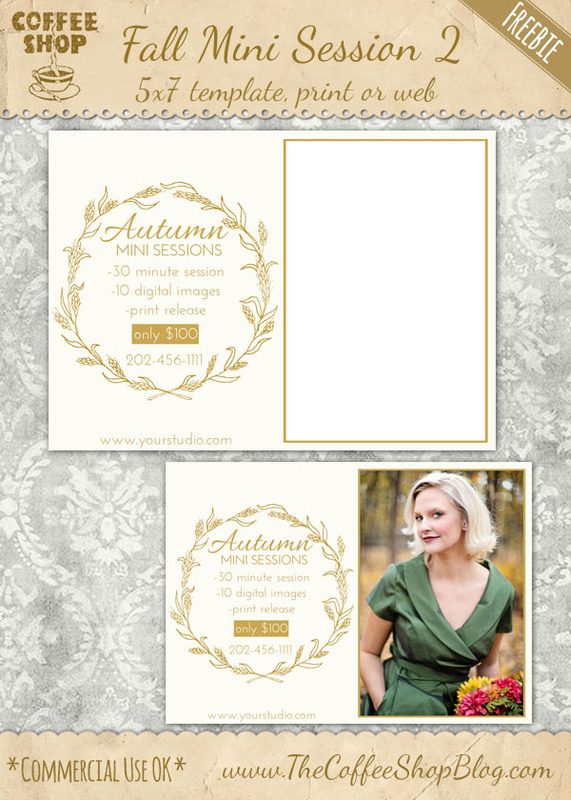 I have had some requests for more fall mini-session photographer templates, so today I am posting a new 5x7 one. I have two more coming out this week. If there is something specific you would like for me to design and post, please leave a comment below. I love new ideas! You can change the font type and colors, change the frame color, and add your image using the clipping mask (tutorial and free action). I used these two fonts (2) on the storyboards and you can download them if you don't already have them. I used a gorgeous image by Jill Wellington (Etsy Shop, Facebook, Blog, YouTube Videos, Pixabay) in my example above. Download the CoffeeShop Fall Mini Session Template 2. You can also download it here. Rita, Thank you for the fall mini session. I was only able to find the Allura font when I clicked the hyperlink for the 2 fonts.